on top of my collage courses I took correspondence courses and between my work,correspondence courses and state approved tests I managed to work my way up to master electrician. Then in the late 70’s early 80’s there was a recession. I could not get a job in engineering. I moved to Mpls. because there was a call for electricians. Could I transfer my license. Nope! Could I take a test to get one in Minnesota? Nope! I was sent by the state to the union? They did not recognize the correspondence course that I took, they did not recognize the six years that I put in the industry or the tests that I took in another state. I have no problems with setting minimum standards for a profession. But unions protect years in the union, not what kind of job you do. Unless you have an in you are on a waiting list. The bottom line is I don’t have a problem with unions protecting the workers. But now they are a political entity. With massive political clout. They have been infiltrated by both communist and socialist. Like I said I worked with two unions in my college years. Both times it was not about qualifications,but how many dues you paid over the years@ now back to my old rant! But when politicians pass laws to protect unions, minorities, cronyism, well then I have a problem. If they would pass a law that you had to hire the best for the price, I would not have a problem. But when you give favoritism to race or unions then you are as guilty as hell. If you can prove that a bid or contract was favoritism at least in the government forum then by all means there should be a lawsuit. But when the government gives preferential treatment to minorities, (doesn’t matter what kind of job they do) Or their union affiliation. The true free market should avail. Not who you know, not what group you are affiliated with but what qualifications you have and what kind of job you can do. Anything else is truly un-American! You will frequently find me on the Topix Forums under the name of Free_America. A true Libertarian who enjoys Hunting,Fishing,Scuba Diving and Photography. You posted to the mogasp blog but your post was incomplete. For me to consider it please complete and resubmit, but I make no promises in advance about approval. Thanks. Martin Pion. Here is an excellent rebuttal of the Klien study. When it comes to the harm done to charitable gambling that has been proven time and time again. The bottom line is that the only studies that show no economic harm were those done by tobacco control. The one done by Kline did not show anything economic. Just raw employment data. Not whether it was full time or part time or whether their tips went up or down just how many people were employed. It ignores the fact that this study was done In Minnesota and over three hundred bars went out of business as a result of the ban. Just in the Mall of America there were fifteen bars and they all went out of business as a result of the ban. As far as your post on my website. 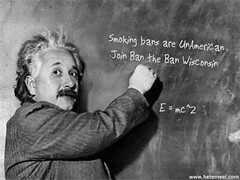 I do not censor my site, I also will let you know that I am a member of Ban the ban Wisconsin. I and we are willing to allow dissenting opinions and are willing to defend our position until hell freezes over. We do not have to censure our site. We present the facts and let the public decide. Hannegan presents the facts. You might not like the facts but they are there for everyone to see. The facts are that you people can not prove one single death caused by second hand smoke. All you have is very weak statistics based on lifestyle surveys. Now how many ex smokers claim to be never smokers just because groups like yours made them out to be the pariah of society? Also since when did the government get to make a minority second class citizens and tax them as such? Can you show any justification to force smokers to pay for non-smokers health care through the S-CHIP? There is no way that you can justify that theft through taxation. You can censure my post and that is fine. I am use to that from tobacco control. I will say that your censorship will speak a thousand words and I will pass it on to every group that believes in the freedom of choice!! 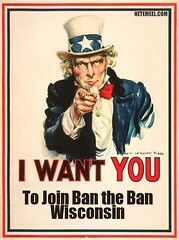 I do not censor my site, I also will let you know that I am a member of Ban the ban Wisconsin. I and we are willing to allow discenting opinions and are willing to defend our position until hell freezes over. We do not have to censure our site. We present the facts and let the public decide. Hannegan presents the facts. You might not like the facts but they are there for everyone to see. The facts are that you people can not prove one single death caused by second hand smoke. All you have is very weak statistics based on lifestyle surveys. Now how many ex smokers claim to be never smokers just because groups like yours made them out to be the pariah of society? Also since when did the government get to make a minority second class citizens and tax them as such? Can you show any justification to force smokers to pay for non-smokers health care through the S-CHIP? There is no way that you can justify that theft through taxation. You can censure my post and that is fine. I am use to that from tobacco control. I will say that your censorship will speak a thousand words and I will pass it on to every group that believes in the freedom of choice!! I’m afraid you misrepresented me in your response. I was not censoring your views: what you had posted was incomplete and ended abruptly in mid-sentence and I was inviting you to resubmit. I don’t censor simply because I happen to disagree with the submittal. I have now allowed your post, although it does ramble somewhat. I hope to post a reply to it later when I have time. MArtin Pion blows his propaganda for thousands of words, but limits you to a couple of hundred. When I told HIM that HE was PART of the problem causing ill health in Missouri, I was banned from his biased site. He wants opinions as long as they are his! The 1,000 character limit for the mogasp blog was approved not just by its members and supporters, but also by opponents of smoke-free air, like Michael McFadden. In fact uber pro-smoking advocate, Bill Hannegan, proposed a 500 character limit! The 1,000 character limit was chosen as a compromise. Children, Children,my blog has to be your battleground? Shei;a, I do not have a word count here but I do ask people to keep it civil. Martin, I would hardly call those fighting for freedom of choice and property rights pro-smoking advocate. And before anyone try to make something about the above exchange between Martin and me, that was in reference to this blog entry.